Drafting a CV can be a very daunting experience. When I first wrote my CV, I remember dreading the task. I equally felt a sinking feeling in my stomach when I had to update it. But, updating your CV is like hitting the gym: the more frequently you engage with it, the easier it becomes. Where should you start? Looking around the internet, you’ll find a lot of contradictory advice. There are far too many misconceptions about CV writing. We’re hoping to clear up the confusion and help you out. In this article, we will detail the basics that will help you get well on your way to creating a stellar CV that will help you land your next job. 1. What is a CV and what is its purpose? A CV, also known as a resume, is an an opportunity to show your skills, knowledge and experiences all in one handy document. 2. 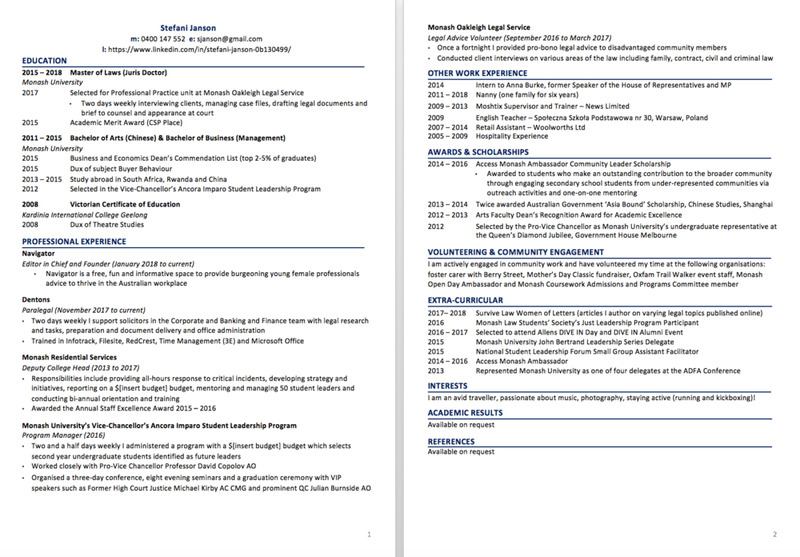 How should I layout my CV? CVs need to be ordered, have a consistent layout, be free of typographical errors and be an accurate representation of your skills and experience. They don’t need to be colourful, include pictures, or have a fancy layout and text. Below, we have provided a template that is a model example of how you should aim to layout your CV. We have also included explanations as to why this style is advantageous. We have included a soft copy in word format, that you can download here, so that you can make your own CV based on this template. Alternatively, feel free to take these lessons and have a go at creating your own! In the heading section, you should include your name in a size larger than the other text in the body of the CV. This makes it easier for the reader (i.e., employer) to immediately identify your CV within a pile, which makes the experience more pleasant for them while making you more memorable. Further, you should include your personal email address and mobile number below your name. Make sure your personal address is professional: no professional recruiter wants to hire partygirlxx@hotmail.com. Stick with your first and last name, and a gmail account is always suitable. If you have a LinkedIn profile, add the URL (if you don’t have a LinkedIn page, don’t worry, we will show you how to make a killer LinkedIn page later in this series). Because everybody now communicates via email, you do not need to include your address. In fact, it may be best to leave it out: sadly, some employers ignore applications if the applicant has a lengthy commute or would need to move homes to take on the role. List your educational experience from most to least recent, including those you are currently doing. You should start by naming the degree/qualification, the school, university or college that you attend, and stating the dates you started and finished it (if you are still studying that degree/qualification, state the end date as ‘current’.) In terms of formatting, employers like dates to be on the left of the page so that they can easily see what you have spent your years doing. Under each degree/qualification, make sure you include any awards, scholarships, study abroad experience, or other achievements. If you achieved “Honours” or “with Distinction”, make sure you also include this. You can include your average mark (GPA/WAM) and highlight some of the subjects you have done well in (for example, 85 (HD) in Microeconomics). Have a think about which information you should include: what is the job you are applying for, and what experiences and skills are needed? Try to highlight those subjects that are most relevant. If you did a subject that is relevant, but didn’t do as well as you had hoped, you can simply say that you successfully completed it. Importantly, you don’t have to include everything: you will see on the second page of our example CV that your academic transcript is listed as “available on request”. Information also becomes less useful as it gets older, so your high school experience will call for less explanation if you’ve done two university degrees since then. Remember, the purpose of a CV is to capture the employer’s attention by highlighting your positive attributes, without going overboard, and always telling the truth! Here is where you outline your work experience to show the employer that you are the right person for the job. This might the most important part of your CV. In our modern job market, more and more people have degrees and qualifications that show they can do the technical side of the job. Because of this, employers are placing more and more value on people’s experiences that show they have “soft” employability skills. Sometimes people get a job for which they are not qualified, simply because their experience shows that they would be a great fit! Any awards or achievements whilst in the role. You should look at your experiences and draft your explanation of your roles with these skills in mind, as ultimately employers will place a higher value on you as an applicant if your experience demonstrates your aptitudes. Note, however, that as you build more experience you may find that your CV becomes too long if you have a full description for every role. For this reason, you may need to exclude descriptions for some of your older or less relevant positions. This section is basically the same as Professional Experience, but it focuses on your volunteer and community work. Outline these roles in the same way. The great thing about volunteer and community work is that it has heart. Try to outline the purpose of the organisation in your description (e.g., “doing X, Y and Z in a not-for-profit organisation that seeks to improve access to education in remote Australian areas”). Your interests. It is great to include one or two lines to make you a relatable applicant. It will also create an easy ‘get to know you’ conversation for the employer in a later interview. Many people list their referees in their CV. However, this is actually an outdated practice. It is better to simply note that your referees are “available on request”. When requested, out of respect, make sure you actually ask your referees before giving their details to any prospective employer. If they give you permission, make sure you give them a ‘heads up’ after each individual time you submit their details so they know to expect a phone call. You should also brief them about the company and role you are applying for, so that they will be able to speak to your strengths and how they will help you in the role. Worried that you don’t have enough experience to flesh out a full CV that will impress employers? Put your mind at ease: you can easily beef up your Education and Additional Accomplishments sections. Think back to your Education and the transferrable skills you have obtained during it: have you been involved in any clubs or societies, have you done assignment pitches, or have you performed well in a group project? These are all valuable to list as they show transferable workplace skills such as communication, planning and teamwork. In your Additional Accomplishments, have you fundraised for a charity event or written for a blog? Again, these are all experiences that you can validly list on your CV and importantly they show personality. You can also add a section in which you note any additional skills you have, like proficiency in computer programs, first aid accreditation or an additional language, as these are sought-after skills in the workplace. You can also start looking to gain more experience: have a look around your broader community and try to find entry level volunteer roles that you can take on. Without going overboard, you can also fiddle around with the formatting of your CV: perhaps you can increase the font slightly or add more white space between sections. Once you have created your spruced-up CV, print it and proofread it in hard copy. Once complete, pass it around to people in your network to obtain feedback: try to find people in your profession, recruitment or in HR. Giving it to someone that doesn’t know your professional background can be really helpful, as they will easily be able to identify if anything is unclear. Once you have integrated all the wonderful feedback from your network, ensure you engage in one last hard copy proof. Save two copies of your CV to a cloud based system: one in word and one in PDF. We suggest this as the word version can be used to adapt into future versions, and the PDF version should be the one you send off to employers. And voila, you are done! Now, that wasn’t so bad, was it?